20+ Best Play Parachute Games For Kids For Giant Fun Filled Activities! 24 Parachute Games for Kids for Giant Fun Filled Activities! The sheer excitement and joy of hearing children playing with a parachute makes anyone smile. Something about the giant rainbow-color and fun parachute games that has kids come running from all over. It gets kids talking, laughing, socializing, and most importantly playing outside. We are huge advocates for the benefits of outdoor play. Being that parachute is a group game, it teaches social and teamwork skills. One thing I like most about these parachute games, besides the fact that it is really fun, is how compact they are and easy to store. It rolls up into such a small bundle and comes out for picnics, beach days, camps, kids birthday party games and even let the kids bring it to school. You might think there’s just that one signature game of bouncing the balls on the parachute, but there are TONS of creative parachute games you can play. 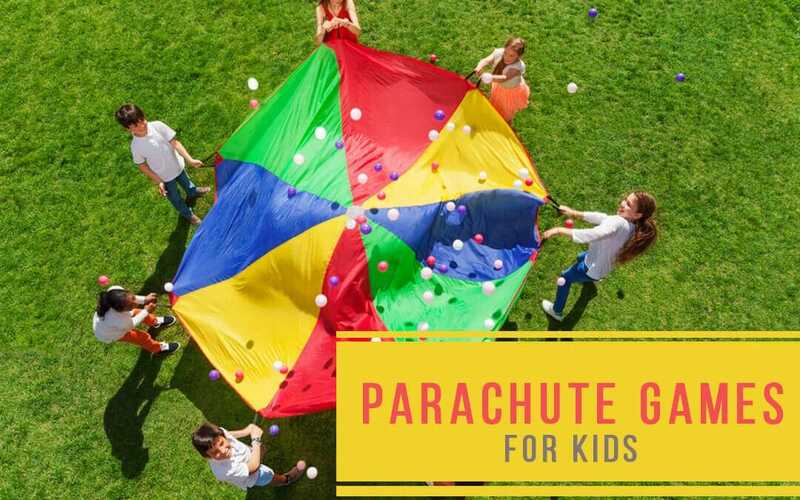 Parachute games are featured in our outdoor games kids list and beach games for kids list. Keep reading for our list of 23 favorite parachute games that will be the biggest hit at your next event. My favorite game is at the end! Choose between an 8, 10, 12, or 14-foot parachute. Ideally you will want a 10 Foot that is perfect for 4-6 kids. If you are looking for a large group of 8+ we would recommend the 14 feet. Take into consideration the extended use and age to determine which type to go for. This is one of the simplest parachute activities to play, and is typically the first game we play. It’s also probably the game you played in elementary school. You place number beanbags, small tennis balls, or whatever you can find onto the parachute. Then when you give the signal everyone shakes as fast and hard as they can make them pop like popcorn. Some variations have the children sit in a circle with their legs underneath the parachute before popping begins. This is one parachute game that does not need much explanation. Essentially you are seeing how far and how high you can launch an object into the air. Place an object like a soccer ball in the middle of the parachute ad have the children lift it above their heads. Try a couple practice motions because the kids will need to pull down and up as quick as possible launching the object into the air. I especially love this game for the teamwork skills. You can launch that ball into the air successfully without all working together. Most play parachutes you purchase will be strong enough for this game, but sure your parachute is good quality before trying. For this you can roll up the parachute to be as thin, but thick as possible. Split up the kids into 2 teams (ideally matched with same strength) and have them hold their ends. First team to pull the other team pass the center line wins. There are a few variations of this, but essentially you try to have the kids roll the balls in the center hole of the parachute. Another version is to see how long they kids can go without having the ball land in the middle, but this can take a lot longer. For the ball, a smaller soccer ball works great. Place several jumps ropes on to the parachute, and make sure it does not touch you. Have all the children shake the parachute up and down and make sure you move it hard enough the keep the snakes from touching you. Have the kids hold on to the edge of the parachute and pretend to be the ocean. With this you can add into your story about a ship in the middle and your waves will be around the weather. From a calm breeze, to a thunderstorm, the kids will have to act as a team in synchronizing the waves to match the weather conditions. Place a ball in the middle of the shoot, and divide the kids into 2 teams. For this parachute game 1 team will try to keep the balls on the parachute, and the others will try to knock it off. One of the more popular games, similar to duck duck goose. For this version, assign each child a color. While the parachute is in motion, when your color is called you must run to the other side before the parachute comes down. Have the parachute moving up and down slowly, so that when it is lifted the child can run to the other side before it falls on them. It takes a lot out of the kids with all the jumping up and down, so it is nice to sit and relax a bit. We call this the Parachute Circus Tent game because it resembles the big show. Here you could hold the parachute high enough for the kids to crawl in or find some props like a fence to keep it up. In here you can sign some songs, tell some stories, or just escape the hot sun. The goal for this one is to see how high and how far you can make the parachute soar. If it is extremely windy out, you may not want to consider this. You may be going for a job while the kids laugh. Inform everyone that on the count of three, you will fly the parachute away. Pull it quickly towards you so that it looks like it’s flying. Partner up all the children with a friend and have them sit on opposite sides of the parachute. Once you call their names they will need to run under the parachute, high five each other, and make their way back. Everyone will try to billow the parachute up and down as high as it can go, on once pulling down (so it shoots up) give them time to race across. Very similar to a merry-go-round except use a parachute. For this game have the kids all hold the sides of the parachute with one hand. With this you turn it into a circle having everyone jump or skip to some music. Once you stop the music, all the children must quickly stop and reverse going the opposite direction. Much like Parachute BFF, except with Parachute Tag when calling each other name they must trade spots with the name of the child you choose. They must make it to their spot, without colliding, before this happens. For this parachute game, the goal is to make the parachute look like a mushroom. For this have the children life the parachute up and down for a few practise rounds. Once they get the hang of it, on the count of 3 they lift it up as high as they can, crouch on their knees, and pull the edges down outside of them. This way all the children are inside the parachute and looks a lot like a mushroom. For this game you need to roll a ball around the outside of the parachute in the circle. It appears to look a lot like a roller derby, or Indy 500, but we like to call it around the world. As the ball comes towards you, you lower your edges, and raise it as it goes past. See how many times you can roll the ball around without falling off, or going in the middle. One of the funniest games to watch, as well play. For this you will normally need 2 adults holding the outside, and have all the children take off one shoe and put in the middle below it. On the count of 3 everyone lifts the parachute as high as they can, then run to the middle to find their shoes before the parachute comes down on them. For this everyone must work as a team to get the tortoise to move about. All the children get underneath the giant shell on their hands and knees. With this you have them walk in a direction of fun little obstacle course. This is a great demonstration to show the children what is static electricity, and will end up with crazy looking hair. Have the children all hold the edges of the parachute with one or 2 kids below. On the signal, you have all the children outside the parachute pull on the parachute back and fourth in a saw-like motion. The child is below with their hair touching this and makes it statically charges with the rubbing from the parachute. With this the children’s hair stands up, and with all they learn kinds of look like a mad scientist. This is guaranteed to give everyone the giggles. For this parachute game you throw a ball in the middle and count the number of waves it takes to get the ball in the hole. When you count the number of waves the parachute makes and watch they try to get it in the hole. Have the kids each pick a spot on their favorite color and wait for this to be called. Once the other players lift the parachute up high, the color you called earlier runs in and out to the middle. When the parachute starts coming down you quickly run back to your original position without it trapping you. Rules are the same as hot potato, but using a parachute instead. Pass a ball into the middle, and do not get caught with it when the whistle blows. If it falls through the middle, or off the side, we create a penalty or punishment rules (perhaps running in a circle 3 times around the shoot). Rules are the same as hot potato, but using a parachute instead. Pas a ball into the middle, and do not get caught with it when the whistle blows. If it falls through the middle, or off the side, we create a penalty or punishment rules (perhaps running in a circle 3 times around the shoot). This game is a lot popcorn, except you time how quickly the kids can knock off all the balls from the parachute. I would put around 15 tennis balls, and use a stopwatch to time. This list of Parachute Games wouldn’t be complete without the best game of all, cat and mouse. Have one child on top of the parachute and one below the parachute, both blindfolded. The remaining children are the wave makers who will continually flap the parachute. The kid on the top, the cat, must find the mouse below the parachute. But they are both blindfolded so they don’t know where each other are and listen for clues. The clues might be the sound of the parachute or from the hecklers. Want more super fun game ideas for kids?